The busy times we’re living in have a major impact on our fishing allowance. Weeknights disappear into the dark and weekends seem to get shorter and shorter. Our weekends are made up of the odd event or birthday that needs our attendance, spending precious time with family, or dreaded housework that needs to get done. All these busy life requirements can make finding time for carp fishing a bit of a challenge, to say the least. Some of us are lucky to have a lake or dam with carp in it nearby, that’s only 15 to 20 minutes away. If you simply can’t put in the time for an overnight or a two-day session, that shouldn’t stop you from catching carp in a short four to six-hour session. You will be surprised what can be achieved in that short period of time. Last year (around June), I had a good four-hour session landing six fish – the biggest was 16kg. 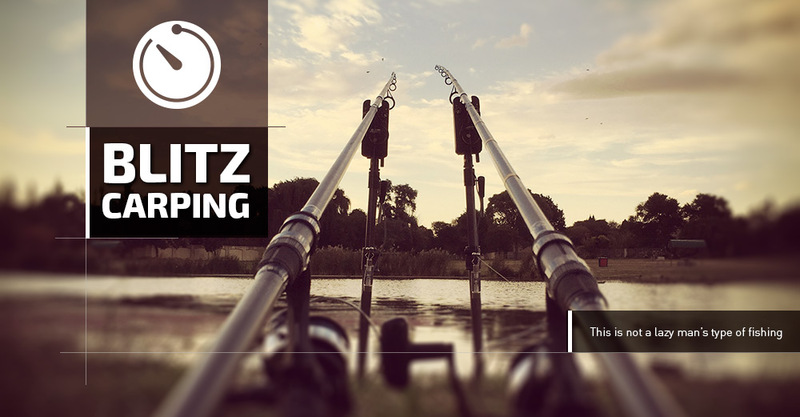 You will more than likely be tired after a day’s work and there will be life’s usual obstacles to overcome, but one thing's for sure: blitz carping is not a lazy man’s type of fishing. It requires a lot of dedication (and it has its frustrating moments), but when it comes together, it is worth it. I suggest trying this type of angling at a familiar lake or dam. You need to have some knowledge about the fish in the specific location, the type of bait that delivers, and where the best spots are, etc. This knowledge will allow you to prepare efficiently for the session ahead and will bring you greater success. Once you arrive at your location of choice, don’t take more than 15 minutes to decide which spot to fish – you need to maximize the time your baits are in the water, and every second counts. Be prepared to blank for hours, but if you think about it – it’s way better than to blank for an entire weekend. There will be times when you ask yourself if it’s really worth it, but when that carp graces your net, all the obstacles will be forgotten and the feeling of accomplishment will triumph. Watercraft is one of the qualities that most of the successful carp anglers have in common. Knowing your water well is a must. This includes things like the type of bottom, features, snags, shallows and depths, and previous catches. All this information will help you to form mental notes of how carp will react or behave at a certain time. Spending precious hours on the bank looking for fish and checking the water features will help in the long run. Temptation is great to simply go fish, but not having a rod with you when exploring your target area for the first time will help you to pay more attention and make you more aware of the signs in and on the water. Trees can provide a great vantage point to spot carp cruising about. Other anglers and line pressure: this can affect your plans, but it can be used to your advantage. Fish tend to retreat in safe areas away from noise and disturbance. The lake might be busy, but it doesn’t mean that you won’t catch fish. Capitalise the spots that aren’t popular, either due to access or being too ‘difficult’. Being quiet is a very important part of short sessions. Minimise casts, but if you feel the rig didn’t land correctly, the spot is weedy or not fishable, recast. But always try to keep disturbance to a minimum. When I caught my new PB a few weeks ago, I had to recast the same rod four times in one hour. The cross wind was taking it too far left, and I wasn’t happy where it was landing. The fourth cast was on the right spot, and less than an hour later I was connected with my biggest carp to date (22,6kg). PVA: The use of PVA is a blessing to any carp angler in my opinion and it can give you the edge you need to get the fish on the bank. I use solid PVA bags in various sizes, as well as a mesh funnel and stringers. The type of PVA I use will depend on the water I fish. On cleaner bottoms I like to use stringers – I believe this method attracts the bigger carp. For quick, almost instant bites, the mesh is the best option and it creates a nice spot around the hookbait. The solid bags are the best option for very weedy waters. Your casting has to be spot on when using PVA, otherwise you will be using a lot of bags. The hookbait (with hook and lead) must be sealed in the bag together with your boilie crumbs or pellets (or other baits you might be using). This will ensure a good bait presentation, even when your PVA bag travelled through weeds. I always try to prepare my PVA bags a day before a session – I place it in a Ziplock bag or bucket. However, if you are using oily pellets, the melting times on the PVA bags will increase. You might want to keep the oily stuff out, or make the bags on the bank instead. Quick Links: I am a big fan of quick links for my hooklinks; my leadcore is basically a loop within a loop. Everything can be removed in a matter of seconds and I always have two to three hooklinks with bait on it, ready to be attached to the line and the rod re-casted. Feeding spells can be very short and your time on the bank limited. If possible, unclip the hooklink from the carp in the net and re-cast the rod with one of the ready-to-go hooklinks. I had bites within minutes from casting, cutting my photography session short with a current catch. To anyone who wishes to start blitz carping, I recommend a two-rod setup. Use banksticks when possible or a very light rod-pod. The new rod carryalls these days can fit your nets (I always carry two), rods and banksticks with the alarms already fitted or a buzz bar, weigh sling and maybe a light brolly if heavy rain is expected. The two-rod setup will make life easier and will give you a chance to concentrate on what you are doing. More rods and tackle will only take longer to set up. Once you become proficient in packing and setting up the two rods, a third one can be brought in, but only when you are confident with your blitz fishing results. Playing a fish over one line is still ok, but when you have two to worry about things can get tricky. A tackle bag is a must to carry all the bits and bobs like end tackle, popups and about one to two kilograms of boilies (or whatever bait you are fishing with), mono line for zigs, some extra leads (not to many though), camera and a small tripod. I take pictures on a timer – lately I use a GoPro. I also pack disinfectant for carp care and other small items that are needed. Remember, the goal here is to pack light! As you gain experience, you will quickly learn what is crucial to carry around, and what isn’t. Your tackle should be effortless to carry from your car to the fishing spot if you cannot drive there. I put my unhooking mat over my carryall and hold my waders (when I use them) in my free arm. A barrow or porter is also good to have, and I use mine when I take a chair or two, or more bait for a longer one-day session. You may ask why I have all these mobile ‘things’ when the carp can swim to my bait. Well, sometimes carp are feeding on natural foods in the dam, but bait between those naturals will be readily taken. Find those fish feeding and you’re in with a chance to bag one. Keeping an eagle’s eye on the water is a must! Once you have made up your mind about fishing a specific location, do not hesitate to move or settle, thinking “this spot will do”, unless you are sure there are fish in your swim. There have been many times where I have changed my swim, or cast somewhere else and have reaped the rewards. Carp rolling (head and shoulders topping over water) are very good indicators of them feeding in the area. Early mornings and dusk are the best times to watch for fish activity, and carp-jumps are also good indicators of where the fish are. If the water is clear, the areas where carp are feeding can be a bit murky or coloured. Noticing very small details can lead you to fish. Keep an eye on reeds moving, holes in weeds and even small silt clouds. These are all good indicators of fish activity. I prefer to fish in areas that are not heavily fished, but that requires a bit of extra work, especially when you have to cut a few branches and reeds to get there – all time-consuming tasks that could cut your fishing time. So, choose and plan wisely before doing it, but also keep the rewards in mind. Blitz sessions are a form of carp fishing that can bring you great results, but need a lot of dedication. I have blanked the last five sessions, and have lost more carp than I have caught this season in short sessions, due to difficult water features. But it didn’t change my mindset; I kept at it and I saw the results. I hope this will be a great guideline to assist you in your blitz session adventures when you are short on time, but hungry for wet lines! Improving your techniques in short sessions will greatly expand and improve your knowledge for longer sessions as well. Until next time, bag a big one.